Please pardon the Iphone picture. I’m such a timid photographer. I often carry my camera to a show or event and then I’m too shy to take pictures. Gah… last night I didn’t even bother taking my camera and there were so many people with big cameras that I would have felt totally comfortable. So, I’m posting the dark, grainy Iphone pic. This post is really for Monica. Last night, three of us chickens were supposed to get together to go see Susan Gibson and Travis Linville at the Blue Door. Susan wrote the song “Wide Open Spaces” and you would have to be from another planet if you haven’t heard that song. However, she’s written tons of other great songs as well. She’s one of Monica’s favorites — along with Creed. We will have to discuss Monica’s love of Creed later. Monica wasn’t able to make the drive to OKC, but Lisa and I decided to go anyway. It was a great show as usual. 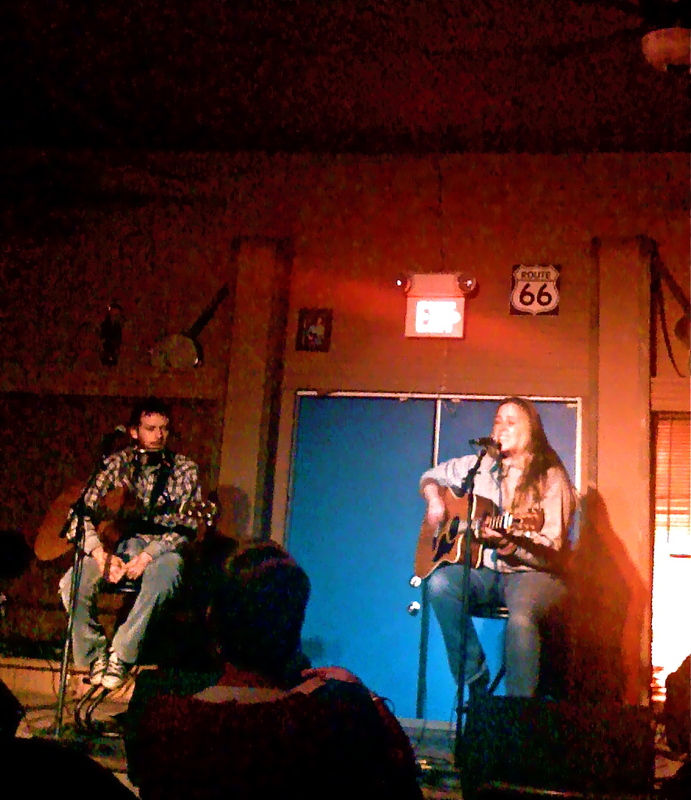 Travis and Susan swapped songs all night and I loved hearing some familiar tunes and some new ones as well. If you are not familiar with the Blue Door, it’s a great listening room in the heart of Oklahoma City. If you go to the Blue Door, you can expect to hear great songs from independent artists who don’t really care what mainstream radio is spinning. It’s one of my favorite places to hear music anywhere. The ticket price is often a little higher — $15 to $20 — but it usually works out that I spend less because I don’t buy drinks there. You take your own drinks to the Blue Door. Last night Lisa and I sipped on a few glasses of Barefoot Merlot that I packed in my purse. 1) Turn your cell phone off. Seriously. Just turn it off and no one will get hurt. 2) Don’t sit and chat during the songs — music fans here, come to listen to every song — that’s why I usually call it a “listening room” when I’m telling someone about the venue. 3) Dress in layers — the climate inside the Blue Door is pretty unpredictable. 4) Bring your own drinks — there’s nothing for sale here other than band merchandise. 5) Plan to smoke outside if you are a smoker. I love this policy! We missed Monica, but Travis and Susan were great as always. My next trip to the Blue Door must be documented by better photos. And, if you’ve never listened to any Travis Linville or Susan Gibson songs — do it! I’m so sorry I missed Susan with my chickens!!!! I’m glad you had fun. We need to get together soon. I miss you.